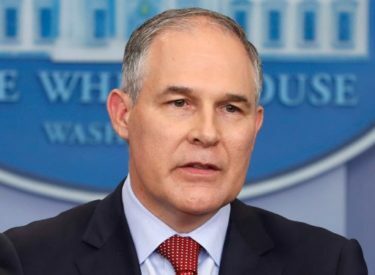 WASHINGTON (AP) – The internal watchdog at the Environmental Protection Agency says it has closed two probes into former Administrator Scott Pruitt’s conduct as inconclusive because investigators were unable to interview him before he resigned. EPA Acting Inspector General Charles Sheehan says in a report to Congress this week that investigators were unable to complete reviews into Pruitt’s bargain-rate rental of a Capitol Hill condo from the wife of an industry lobbyist and efforts by Pruitt’s government staff to pursue business opportunities for his wife, including seeking a Chick-fil-A fast-food franchise. Pruitt, a staunch fossil fuels advocate, was forced to resign in July following a string of ethics scandals, and his deputy, ex-coal lobbyist Andrew Wheeler, was named acting administrator. President Donald Trump has indicated he would nominate Wheeler to the job permanently.